TOPAZ HORIZON: We won the book fight! My blogger friends Zemirah, Sippinslow and JenAspacio have alerted me to what is possibly the most wonderful news this summer! 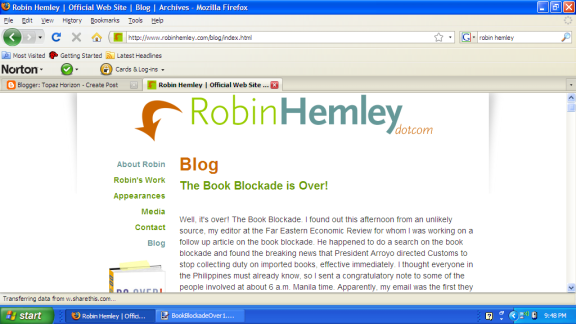 The Great Book Blockade, which levied taxes and other duties on imported books, is now over! 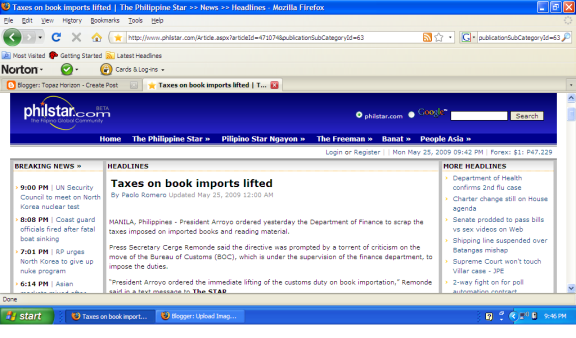 Just this morning, newspapers happily reported that President Gloria Macapagal Arroyo ordered the Department of Finance to immediately lift "the customs duty on book importation," Press secretary Serge Remonde said. “The President wants books to be within reach of the common man. She believes reading as an important value for intellectual formation, which is the foundation of a healthy public opinion necessary for a vibrant democracy,” he added. Well, thank you very much, Madame President! And thank you, too, to Robin Hemley, who made us all aware of this distressing fact (and who mentioned my post about this issue on his blog. Yey!). Thank you to all the Filipinos who stormed the government with their protests, done intelligently, I'd like to add. Thanks to the media for giving this issue proper attention. And thank you to the international communities led by UNESCO who helped trash this law in such a short time! Democracy is well and alive in the Philippines. I now know this and my heart lifts with fierce pride and glorious hope! We didn't even need to stage rallies and violent protests. No one died, no blood was shed. The strength of bloggers amazes me. I didn't know we were this influential! As Oasis sang, "I'll start a revolution from my bed." We started it and now we won. What else can we achieve? Read my blog post on the issue here. Read more about the developments, as reported by Robin Hemley, here. Wow, this is indeed good news. And it's enlightening to know that people really can make a difference if they try hard enough. Hi Anonymous (who I wish was brave enough to reveal your identity), nope, I used it correctly =D Distressing means to cause worry, to upset. So "distressing fact" means the fact is upsetting. I really like reading your blog because you seem so real. And I'm so happy to be reading someone who's proud to be Pinoy -- not in the madamdamin, theatrical, dramatic way, but in the plain, in-your-face, can't-explain-why, true Filipino sense. Keep blogging and we'll keep reading! Anonymous 7:05, you should have used "incorrectly" instead of "wrongly." Edit yourself first especially when you're editing an editor-in-chief! Frances, you go have a good weekend and hooray!